We’re not so sure that this area constitutes a “central business district,” but nevertheless the CBD Hotel enjoys an excellent location in the heart of Surat. Average rating 8.1 from 732 reviews. The fairly large flashpacker-style hotel delivers good value on spacious rooms with plenty of in-room amenities. Accessed by a lift from a glossy lobby, the cheapest rooms come with soft beds, lots of space and nearly wall-size windows that afford slight river views from the upper floors. The room that we checked out was partitioned into two separate areas by a central divider wall, with the bed and a wall-mounted LCD TV on one side; and a closet, larger than average fridge with minibar and desk on the other side. The bathroom was large and modern, with a hot-water shower partitioned behind glass. It had a slightly off-putting smell but not enough to bother us. The hotel is located at the corner of a busy intersection and rooms facing the street will get a murmur of traffic noise along with light from street lamps sneaking past the sides of heavy curtains. Rooms on the other side face the hotel’s car park and will not have river views, but will be quieter. The free WiFi in the room we stayed in worked extremely well. While the standard rooms (the hotel calls them “deluxe”) should be fine for most flashpackers, the CBD also offers “junior suites” with sofas that will probably do the trick for families. The staff was efficient during our stay, though we wouldn’t mind if they smiled every now and then. Location is a major selling point, with the night market, riverside and downtown bus stations all within a 10-minute walk. 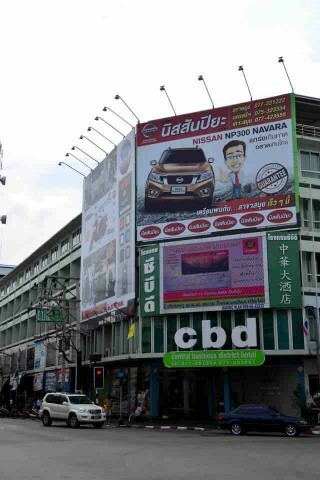 If the CBD is too pricey, pop next door to the Tapee Hotel for older rooms that have undergone some renovations in the 400-500 baht range, or walk a block east to the more backpacker-oriented My Place. Check rates at CBD Hotel on Booking.com.